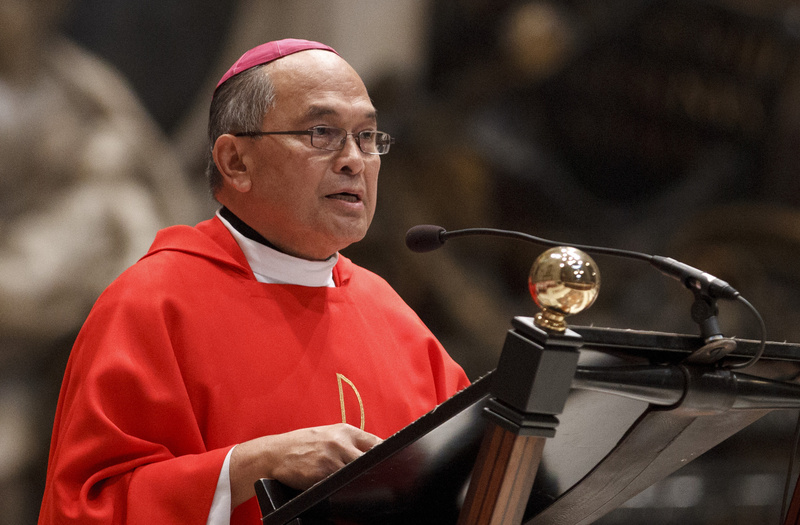 A Vatican tribunal has found the archbishop of Guam, Anthony Sablan Apuron O.F.M. Cap., guilty of some of the accusations against him, which included the sexual abuse of minors, and has removed him from office and prohibited him from residence in the archdiocese. The verdict came in a press release, issued today, March 16, from the Apostolic Tribunal of the Congregation for the Doctrine of the Faith. The tribunal, which is composed of five judges appointed by the Prefect of the Congregation, “has issued its sentence of first instance, finding the accused guilty of certain of the accusations and imposing upon the accused the penalties of privation of office and prohibition of residence in the Archdiocese of Guam,” the statement said. A Vatican source told America that the archbishop no longer has any office as a bishop, though he remains a bishop. He has not been dismissed from the clerical state. Moreover, the tribunal’s statement said Archbishop Apuron has been found guilty of only “some of the accusations,” which included the sexual abuse of minors, but it did not identify which ones. In recent years more than 100 lawsuits have been filed against the archdiocese for alleged abuses between the 1950s and 1980s. Guam is a predominantly Catholic island of some 160,000 people, and a U.S. territory of high strategic military importance to the United States because of its location in the Marianas Islands, which has been rocked by the abuse scandal that involved the archbishop and several priests. In recent years more than 100 lawsuits have been filed against the archdiocese for alleged abuses between the 1950s and 1980s. In May 2016, several former altar-boys accused Archbishop Apuron of sexually abusing them in the 1970s and filed lawsuits against him and the archdiocese. One the archbishop’s nephews also accused the archbishop of abusing him in 1990. Once the news became known, Pope Francis imposed a leave of absence on the archbishop in June 2016 and named an apostolic administrator, Vatican-based Archbishop Savio Hon Tai Fai, to run the diocese for several months. In November 2016, the pope appointed Detroit auxiliary bishop Michael Barnes to take over, and from that point on while Archbishop Apuron, a member of the Neocatechumenal Way, still held the title of archbishop of Agana, he no longer had the faculties, rights or obligations pertaining to that office, which were given to Archbishop Barnes. In February 2016, the Vatican sent Cardinal Raymond Burke to the island as presiding judge at the canonical trial of Archbishop Apuron. Cardinal Gerhard Muller, then prefect of the C.D.F., appointed him to this position. The panel of five judges headed by Cardinal Burke reached a verdict last October. Archbishop Apuron is one of the highest-ranking church officials to have been tried and found guilty by a Vatican tribunal for accusations that included the sexual abuse of minors. What does this mean:" has been found guilty of only “some of the accusations,” which included the sexual abuse of minors, but it did not identify which ones." Is that statement to justify the fact that he remains a bishop and in the clerical state, which was previously mentioned? He needs to return to the lay state not remain a cleric and all information turned over to public authorities so he can be tried in a secular court of law. This man is a sexual predator and criminal. The charges against this archbishop are all beyond the statute of limitations for Guam. It's Bishop Michael Byrnes, not Barnes, Gerard.